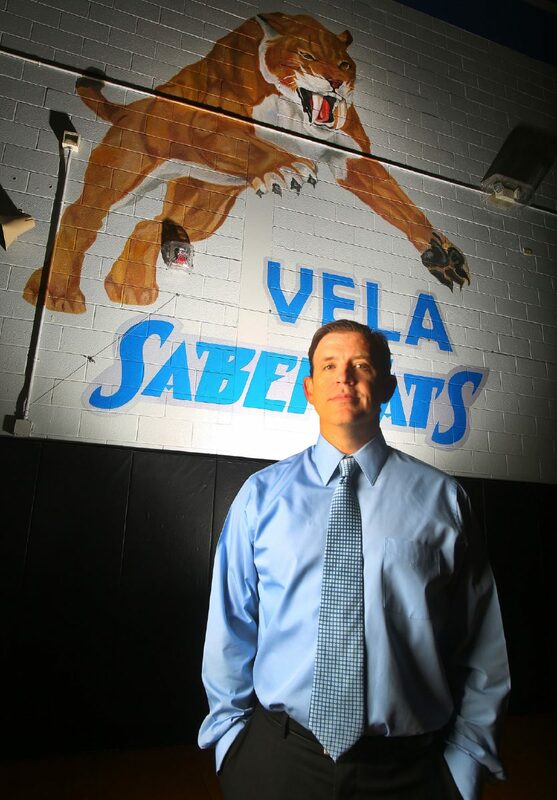 Coach of the Year, Edinburg Vela's David Keith, poses at Edinburg Vela at Edinburg Vela High School on Thursday, March 22, 2018, in Edinburg. EDINBURG — Coming into the 2017-18 season, Edinburg Vela appeared to be a program on the verge of total disarray. Still, new coach David Keith found a way to bring his team together and put the focus on one thing: basketball. Keith, who coached at Sharyland High for 18 years, was hired as the coach at Vela on April 12, 2017. The SaberCats (18-5, 11-3) missed a share of the District 31-6A title by one game, won a bi-district championship and advanced to the area round of the playoffs. For his coaching this year, Keith is The Monitor’s 2018 All-Area Coach of the Year. Keith remembered a quote while reflecting on the year: “Plant a tree, under whose shade you do not expect to sit,” from Nelson Henderson. In 2016, most of Vela’s district wins were vacated and the team’s chance at another playoff run was snatched away when the district executive committee ruled the team had used an ineligible player. A very large contingent of seniors left the team. Coach Lalo Rios resigned. That left Keith with a fresh plot of dirt on which he could plant the foundation for the Vela program. It wasn’t easy. Keith was without a coaching staff from the time he was hired until the summer, when he could bring on his assistants. Keith embraced the challenge from the very beginning. He worked with the younger players, preparing them for the varsity game. He worked with his experienced players, showing them how to take control of the team. He navigated the perils of divvying up playing time without alienating his team. Even if he did upset some players, Keith had a plan. Rodriguez was an assistant at Edinburg High for six years before joining Keith at Vela. Another assistant for Keith was Homer Garr, who was the head coach at Rio Grande City prior to this season. Garr took the job at Vela to be close to home so he could help take care of his son, who was diagnosed with Type 1 diabetes. One of Keith’s proudest accomplishments this year was helping senior guard Trey Chavana feel comfortable playing the sport he loves again. Chavana left the team last year because he felt the coaching staff was treating him unfairly. He was alone, and disappointed, and frustrated. When Keith got to Vela, he talked with Chavana and let him know he was welcome on the team. Chavana responded by bringing his game to the next level this year. He averaged 9 points, 2.3 rebounds and 2.9 assists per game. During Vela’s toughest games, Chavana was relied on to handle the ball through whatever chaos the defense threw his way. Keith, too, learned to roll with the punches. If Keith can continue to build upon the foundation set this year, he may yet get to enjoy the shade of that tree.